We sunk our teeth into the colorful internet sensation from Kala Toast in Hong Kong — and you should, too, the next time you’re in the city! 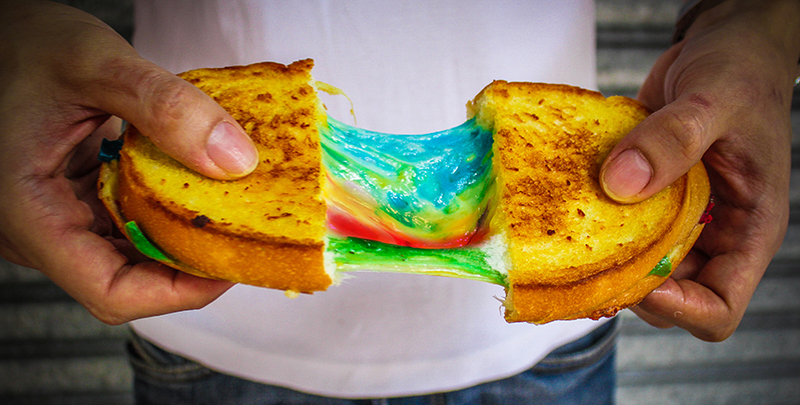 You might’ve seen it online — the rainbow grilled-cheese sandwich by Hong Kong’s Kala Toast. It became a viral sensation recently, with outlets such as The Huffington Post and Buzzfeed running news stories about it. Called KALAful, the sandwich is filled with tomato-, lavender- and basil-flavored cheeses in red, blue and green respectively, plus a combination of cheddar, emmental, gruyere and mozzarella. If you’re put off by the colors, don’t be — they’re extracted from actual tomatoes, lavender blooms and basil leaves, said Kala Toast owner Jack Tam. The cheeses, meanwhile, are sourced directly from Europe. The KALAful surely looked good onscreen, so when I found myself in the city, I headed for Tsuen Wan to try it out. I ordered the king size (HK$42), which had twice as much cheese as the regular (HK$35) one. The bread was toasted nicely — a bit crisp on the outside, but moist on the inside. The taste was well-balanced, with the tomato, lavender and basil flavors complementing the saltiness and sweetness of the cheese. It was a bit oily, though, so you might want to share the snack with a friend.